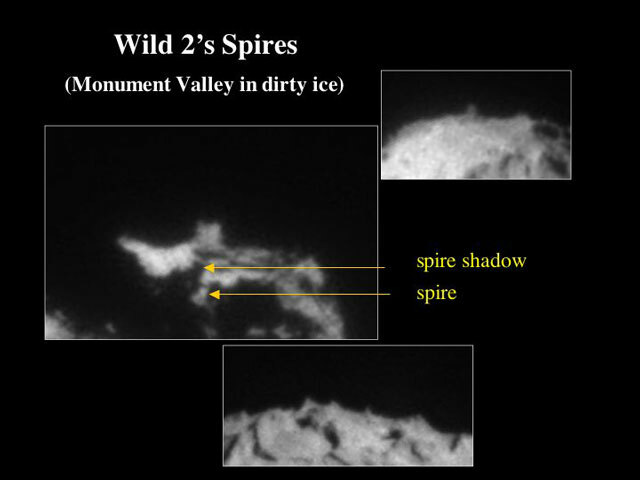 Explanation: How did unusual spires form on comet Wild 2? Close inspection of images taken of Comet Wild 2 by the passing Stardust spacecraft in January show numerous strange pinnacles as long as 100 meters long jutting off the surface. The pinnacles were unexpected - close-ups of other comets and asteroids show no such features. In fact, no other Solar System object besides Earth is known to show such unusual structures. Other unusual Wild 2 surface features including long cliffs, deep pits and craters, and numerous active jets. Together with the spires, these features are hypothesized to be indicative of a very rigid surface sculpted by impacts and explosive sublimation. Initially, Wild 2 was expected by many to be held together only quite loosely. Stardust is scheduled to fly by the Earth in 2006 and drop off a sample of Wild 2 for detailed scrutiny.